Heath Bunting represents London or different well known areas of London with black and white drawings. He uses different directional signs as buttons in the bottom right hand corner of the page to lead you to different places in London. The use of buttons is a characteristic that is specific to the medium of the Internet. By being able to use buttons, Heath Bunting is able to bounce the viewer from place to place depending on which button the viewer chooses to use. 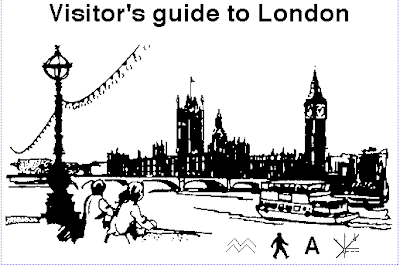 This would not be possible if the viewer was viewing his Visitor's Guide to London in book or magazine form. The total control of the viewing would be in the hands of the viewer instead of by some manipulation of Heath Bunting. I feel that by viewing it on the Internet and having Heath Bunting take you to different places according to which button you choose, gives it some fun element of surprise. "Heath Bunting emerged from the 1980s committed to building open/ democratic communication systems and social contexts. He came from the street up, passing through and often revisiting graphity, performance, intervention, pirate radio, fax/ mail art and BBS systems to become an active participant in the explosion of the Internet. Between 1994 and 1997 Bunting produced many Internet projects, which can be accessed at the server «www.irational.org» set-up by himself. Recently, he has moved into the field of genetics proclaiming it to be the next ‹new media›, and is also developing work in the area of physical network performance."